UPDATE: Hurricane Florence made landfall Friday morning at 7:15 a.m.. Follow LIVE updates here. With landfall just hours away, the coast of North Carolina is already feeling the power of Hurricane Florence. The storm has been downgraded to a Category 1 hurricane. Streets began to flood earlier in the day Thursday as high tide came in and hurricane-force winds were already being felt onshore. Severe Weather Team 2 Chief Meteorologist Glenn Burns said wind speeds had already reached more than 85 mph over the North Carolina coast late Thursday night. The last update from the National Hurricane Center said Florence had sustained winds of 100 mph, with gusts up to 120 mph, and the storm's center was about 50 miles off the coast of Morehead City, North Carolina. "The storm is moving very slowly, but even though we don't have a major hurricane, the wind field is absolutely huge," Burns said. On top of the wind, the rain is expected to devastate the area. "Up to 30-inch rainfall totals are expected," said Severe Weather Team 2 Meteorologist Brad Nitz. "Some spots could see 40 inches of rain." Atlantic Beach in New Bern, North Carolina, was already reporting 12 inches of rain late Thursday night. The storm is expected to move very slowly, dumping more rain across the state before moving north over the weekend. SOUND ON: Tropical storm-force winds lash the North Carolina coast as Hurricane Florence approaches. There is a storm surge warning for most of the coast of North Carolina, with a surge of 4-11 feet expected. A storm surge watch is in effect for the coast around the Charleston, South Carolina area. Severe Weather Team 2 Meteorologist Brian Monahan is in Wilmington, North Carolina where he saw conditions go downhill fast throughout the day and evening. He said the wind had already gotten strong enough that he was having a hard time keeping the hood of his raincoat on his head. Severe Weather Team 2 is tracking Hurricane Florence as it approaches the East Coast, for updates on Channel 2 Action News This Morning, starting at 4:30 a.m.
All 159 Georgia counties are under a state of emergency as Hurricane Florence approaches. Gov. Nathan Deal issued the emergency declaration Wednesday after Florence's track shifted slightly to include part of Georgia. “In light of the storm’s forecasted southward track after making landfall, I encourage Georgians to be prepared for the inland effects of the storm as well as the ensuing storm surge in coastal areas," Deal said. Georgia’s Emergency Management Agency activated its special operations center early Thursday morning. 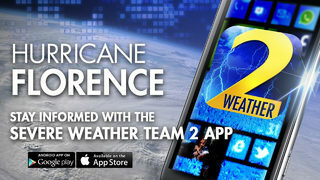 Severe Weather Team 2 says in metro Atlanta, Florence will bring some rain, but wind should not be an issue. By the time it reaches Georgia late Sunday into Monday, it will likely be a tropical depression. The brunt of Florence’s impact should be felt in the northeast corner of the state, and it won’t be much. Two to four inches of rain and wind gusts are possible. The mountains could see six inches of rain and minor flooding. Good news, if you're headed to Music Midtown this weekend, you can breathe a sigh of relief. Most of the festival should be hot and dry, but rain clouds could loom when Imagine Dragons and Kendrick Lamar take the stage in the 8 p.m. hour Sunday. On Thursday, UGA announced that it is moving up the time for Saturday's game against Middle Tennessee State University to 12 p.m. to accommodate travel for those in areas that will be affected by the storm. Interests elsewhere in the southeastern and mid-Atlantic states should monitor the progress of Florence.